Slaughtneil have done quite well on their return to the junior ranks with a Thirds team, two wins and a draw representing a fair return in their 12 games. When the sides met at Drummullan the Emmet’s racked up an excellent score of 4-05 to Ogra Colmcille’s 2-15, a four point defeat probably their best display of the season to date. Ogra should chalk up their ninth win of the season with a bigger margin of victory than the first meeting. Two points separate these teams at the bottom end of the table, both enduring rather times in the Junior ranks this season, Ardmore on 6 points with three wins from ten games, Glack on 8 points with three wins and two draws from their twelve games. When they met at Brolly Park Ardmore stunned the home side with a convincing 4-09 to 1-09 victory. Ardmore will be keen to make it a ‘double’, Glack perhaps struggling to get the better of the home side. Undoubtedly this is the match of the round, with the Wolfhounds in a ‘must win’ situation as they have already lost twice this season and another defeat would rule out any chance of overhauling the unbeaten leaders who have a perfect 12 wins from 12 games, including a 3-06 to 0-09 victory over Limavady. The latter’s other defeat was also at the Wolfhounds’ ground when Ogra Colmcille won 0-14 to 0-10. Drum have been playing with a confidence that has produced a sparkling run of top drawer displays and they will be strongly fancied to win this game to put themselves in an invincible position to win not just the league title but also promotion to Division 2 with just five games remaining. When Rossas made the long trek to Magilligan at the beginning of May they had a chastening experience as they crashed 4-23 to 2-03 and they will be keen to avoid a similar outcome at Rossa Park. However it’s unlikely that they take any solace from the visit of the third placed team in the junior division. Magilligan have won 9 of their thirteen games and should make it 10 with a fair bit to spare. 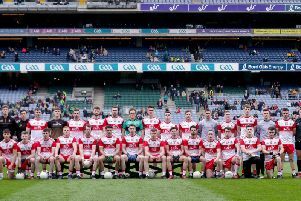 Doire Colmcille are enjoying their best season in many years, sitting comfortably in the top half of the table with five wins and a draw from their thirteen games. Clearly a new home at Páirc Cholmcille has inspired the players. Now they travel the short journey to Creggan to Dolan’s refurbished park at Piggery Ridge and they will be keen to take the two points and widen the gap between them mid-table to three. Dolan’s won the first game by 1-13 to 0-06.